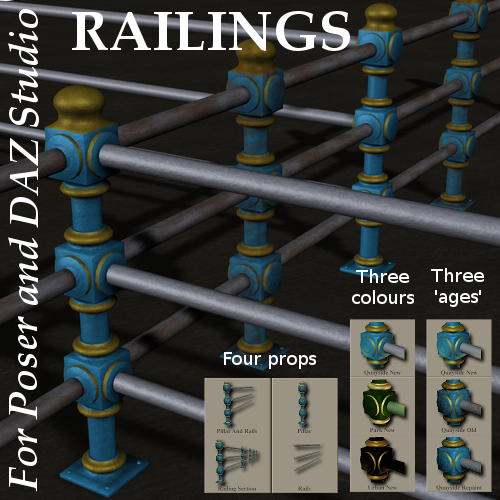 A set of four simple railing props for Poser and DAZ Studio that can be connected together to form a variety of larger railings by simply parenting, Y rotating, and X/Z translating. Three colour schemes (quayside, park, and urban) with three 'ages' (new, old, and repaint) for each. The ZIP contains THREE main folders: 'Runtime', 'Runtime (Extra DS Files)', and 'DS Content'. Poser users only need the first, DS users need all three. See the readme for more details. Lukon (7 months ago) Inappropriate? Incredibly useful kit! I've tried lots of different approaches to fencing for my sets, but this is the one I keep coming back to. Thank you for sharing! I remember seeing railings like this on a TV program, thinking "those look really cool,and I bet they'd be easy to model", and doing just that! Very beautiful and so useful! Thank you very much! I love the look of those connectors! This is great! Thank you. SimonJM (6 years ago) Inappropriate? Very nice even without the incline morphs - thank you! You're welcome - it was fun creating them! But I just spotted an obvious limitation - you can't use them on a slope, or around a curve! So I'm working on an an update - a couple of extra morphs in the PP2s. I'll post back here when the fix is ready.